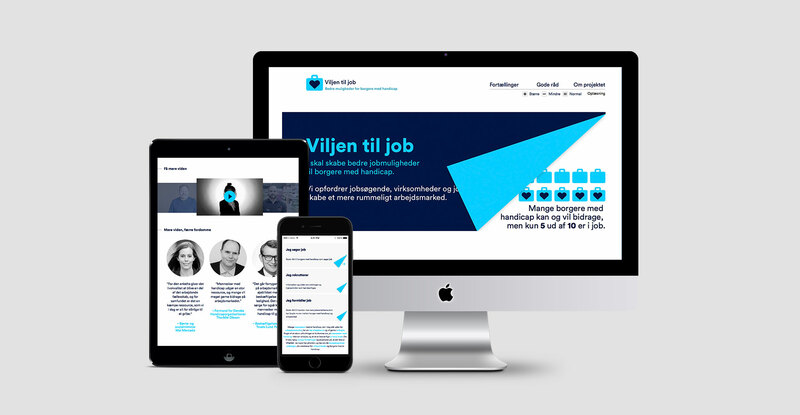 In 2017 and 2018 BystedFFW developed the campaign ‘Viljen til job’ for the Danish Agency of Labour Market and Recruitment. The mission was to develop, and launch a campaign that should be part of a movement towards creating a more inclusive and tolerant labour market for people with a disability. The campaign was developed in a way that should make the three affected parties, people with a disability, job centre consultants, and employers, go into an alliance and work together to create a shift in this area as a change demands an effort from all three parties. The campaign lives on its website www.viljentiljob.dk, where information through videos, facts and formal texts can be found. Additionally, the campaign and its information were spread through online HTML and video based banners.